Be Prepared this Christmas! 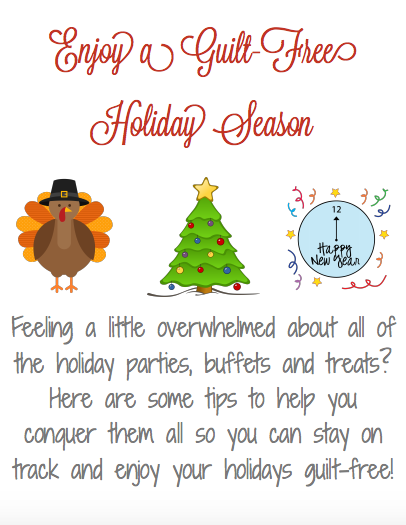 Here are my best tips to help you stay on track and avoid feeling guilty after the holiday! You embarked on this healthy journey for a reason. You do not need to indulge for weeks on end and then feel miserable. You and your body deserve more than that! You have willpower and a goal, remember that and don’t give in to temptation after temptation! We are not here to tell you to deprive yourself. This is a lifestyle and in life we have treats! It is totally ok! What is not ok is to have treat after treat until you feel miserable and defeated. Plan out your treats and stick to your plan. For example, I plan to stay on track and then enjoy my Thanksgiving meal, dessert and all, guilt free. After, I will jump right back on track! Treats have consequences. Salty, sugary, and fatty foods are seriously addicting and leave us craving more. Often, this means falling far from our goals so think to yourself, “Is this really worth it or do my goals mean more to me?” Yes, that fried gooeyness may taste good for a moment, but what does it do for you in the the long run? This is such an important time to get your body moving! Do not start slacking off in your workout routine. Working out gives you endorphins and a clean mind to make good decisions. Schedule it in! Make it a priority! If you are traveling, take your DVD’s with you or get some good use out of your walking shoes. Be proud of the choices you are making, don’t be embarrassed to show off your movies in front of family. Wake up early and get it done! You will feel a million times better if you stay on track. Remember, we want to go into 2016 feeling incredible and confident in our bodies, not stuck starting over for another year in a row! Be sure to follow me over on FACEBOOK for more daily motivation and inspiration! See you over there!